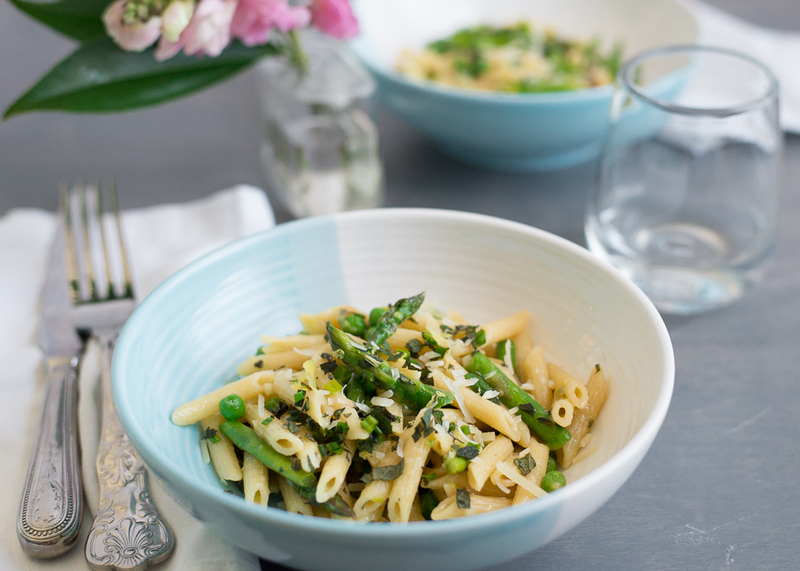 This is a perfect creamy but light pasta for early spring, using spring veggies that are often found in the farmers market. This recipe comes from this month’s Cook’s Illustrated, and be warned, it is NOT a quick recipe. This would be a great one to make on the weekend when you have time to invest in the steps it takes to make the stock. If you have the patience you would ultimately create a great tasting dish. While the original recipe called for leeks, I used the spring onions instead, and they worked wonderfully. I decided to try one of Wegman’s speciality pastas, called “Barilotti” which is a grooved pasta that worked well with the sauce (definitely worth a little extra money to get a quality pasta). The kids loved this one and ended up eating a ton of veggies. The sauce feels creamy and is very flavorful. This is achieved with adding the wine and vegetable broth and cooking it into the pasta, instead of actually adding cream. VERY tasty and healthy too!! This is a great side dish but could also be a one-pot dinner with the addition of some grilled chicken breast or shrimp. Coarsely chop tough asparagus ends and place in a medium sized pot with green parts of spring onions or leeks, 1 cup peas, vegetable broth and water. Bring to a boil and simmer for 10 minutes. While this is cooking, combine chives, lemon zest and mint in a small bowl and set aside. Take asparagus spears and cut into ½ inch pieces. After broth has cooked strain veggies off, discarding them and measure broth. Add a bit of water to equal 5 cups of broth. Place back into pot and maintain at a low simmer. In a Dutch oven heat 2 tablespoons oil over medium heat. Cook light parts of spring onions or leeks for 2 minutes with a pinch of salt, and then cook asparagus for 4 more minutes, or until softened. Add garlic and pepper flakes and cook until soft and fragrant. Add remaining peas and cook one more minute. Remove these veggies and wipe the pot out, setting them aside. Heat 4 tablespoons oil until shimmering and add uncooked pasta, stirring until almost brown. Add wine and cook about 2 minutes until wine is absorbed. Add hot vegetable broth and continue cooking at a boil. Stir frequently until pasta is al dente and most of the broth is absorbed, about 8-10 minutes. Remove the pot from the heat. Stir in lemon juice, parmesan, veggies and half of the herb mixtures. Serve with remaining herbs and a sprinkle of parmesan cheese. Add salt and pepper to taste. Pasta is a great finger food for baby. Cook a little bit of the pasta extra long to make it even more soft, and cut into small pieces. Smash some peas on baby's tray to encourage the pincer grasp.